Food writer Michael Pollan, author of In Defense of Food, The Omnivore’s Dilemma, and other books, re-defined what it means to eat smart when he shared his credo: Eat food. Not too much. Mostly plants.
? Now this doesn’t mean you have to become a vegan, or even a vegetarian, if you don’t want to. Small changes in your diet can yield big results. And, studies have proven that a plant-based diet—one based on vegetables, grains, legumes and fruit, with little or no animal products, including dairy—can reverse diabetes, high blood pressure, heart disease and certain cancers promoted by scientifically generated foodstuffs, genetically modified foods and animal products. As a vegetarian I should say that just being a vegan or vegetarian doesn’t necessarily mean you’ll have a healthy diet. As a vegan, you could still eat highly processed foods like potato chips and french fries. The key to a healthy diet is to eat a low fat whole-food, plant-based diet and use minimally processed things. So, whether you’re an omnivore, pescatarian, vegan, vegetarian or any other diet configuration, one thing is certain, adding more whole and plant-based foods means more nutrients, antioxidants, vitamins, minerals, fiber and less damaging fat—all needed for optimal health. As a global public health professional, I’ve been interested in chronic diseases—obesity, diabetes, heart disease, cancer and other ailments—that have been on the rise here in the U.S., and in many other countries around the world. I’ve also been interested in strategies that reduce the incidence of morbidity and mortality from such diseases. Looking for links between diseases and their possible triggers—from diet and lifestyle to environmental and genetic factors—is fascinating. And everyday, research sheds more light on new ways to help people adopt healthier lifestyles and minimize or prevent their risk of getting disease. Part of the beauty of a adopting a plant-based diet is that it empowers us to be healthier and happier than we ever imagined possible! In a couple of weeks I’ll be heading to sunny California to attend the International Plant-Based Nutrition Healthcare Conference. I’m excited as many of the leading experts and researchers in the preventive and healing power of plant-based nutrition will be there to speak. I hope to blog and share any new and interesting information I glean while there. Until then, I’ll share a few plant-based recipes I’m making at home. 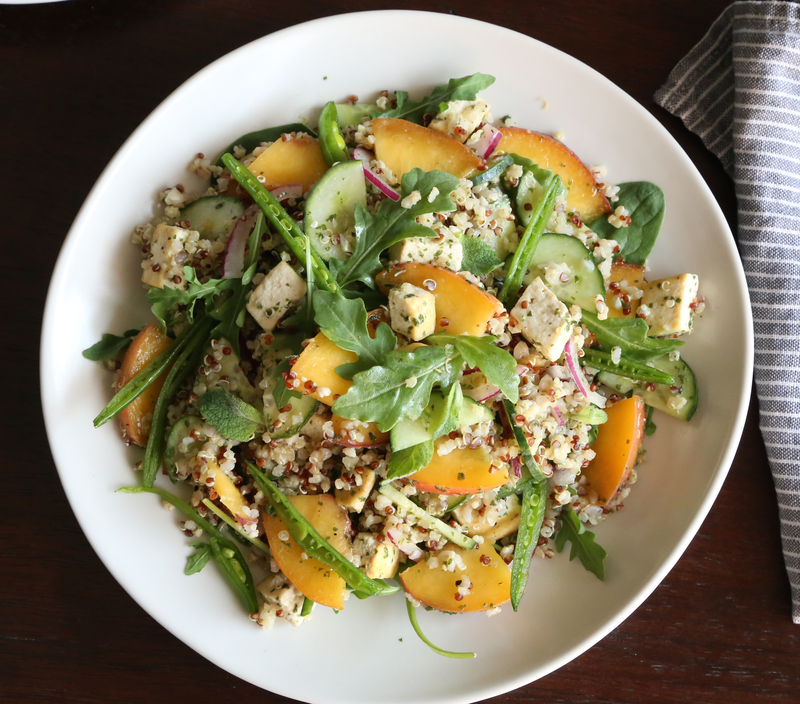 Here’s a salad I made with super grains (a blend of white and red quinoa, millet and buckwheat), peaches and tofu. Nectarines would work just as nicely as peaches, so use whatever is available. I also added a handful of sugar snap peas for added color and texture. Bring 2 cups water to a boil in a pot. Add grains, reduce heat, cover with lid and simmer 15 to 20 minutes. Remove from heat and let stand covered for 5 minutes or until water is absorbed. Fluff with a fork and allow to cool. In a bowl, combine tofu with 2 teaspoons olive oil. Season generously with salt and pepper. In a large skillet, add the tofu and cook over moderate heat, turning until golden, 5-10 minutes. Remove from heat and allow to cool. In a large bowl, toss peach slices, cucumber and onion in remaining olive oil. Add cooled grains and tofu. Put the mint, vinegar, sugar, lemon juice, olive oil, salt and pepper in a food processor and process until smooth. Taste and adjust seasoning. Drizzle the vinaigrette over the salad mixture and toss gently to coat. Cover and refrigerate the salad for at least an hour. Just before serving, gently toss with the torn mint leaves and sugar snap peas. Serve alone or on a bed of fresh greens. * I used a super grain blend of red and white quinoa, millet and buckwheat. If you can only find quinoa, that’s fine. You can still make this salad with just quinoa. **The finer you slice the peas, the prettier they will be in the salad, but if you’re in a hurry, you could simply chop them. Or, you can blanch them and leave them whole. Hi Ngan, thanks for your comment! Good for you! Your rule for your plate is a great one! There are some other plant based diet resources (books and movies) I should have share in this post. Perhaps you may or may not have heard of them? I highly recommend them—Books: The China Study and The Pleasure Trap. Movies: Forks Over Knives. This is a documentary film that advocates a low fat, plant based diet. All the best to you as you continue eating more plant based foods! I just finished reading In Defense of Food! It was very thought provoking… Can’t wait to hear what you learn at the conference. Sounds like it will be interesting. Hi Beth! So nice to hear from you and so happy to know that you’ve been following the blog and enjoying it. I would LOVE to go back to Guam for a visit someday. Perhaps when my little one is older. I want him (and my husband) to see Guam’s beauty and to see the place that became such a significant part of my life! Hopefully we’ll visit again soon! Thanks for commenting and I hope I’m hoping to share what I learn at the conference. Much love to you! It’s so nice to read about other peoples opinions when it comes to eating healthy, specifically when it comes to less-meat. I completely agree. We still eat meat in this house, but we’ve managed to cut ourselves down to about half of what we consumed before- so I’d say we are making progress ! Hi Ashley, I truly believe eating healthy comes in a variety of packages. I know some meat eaters who are much healthier than a lot vegetarians I know. I’ve been vegetarian for a long time, but I can’t honestly say I’ve always eaten a healthy diet. In recent years I’ve tried to focus more on a plant-based diet, adding more nutrient dense foods to my daily diet. I don’t think health is necessarily about what you remove from your diet, but more about the things that remain—the “fuel” used to sustain you. So, congratulations to you on the progress you’ve made!!! It’s the small changes that can make a huge difference! Lovely recipes and pics! Look forward to seeing you at the conference! Thanks Christine! Looking forward to seeing you too! Thanks Luke. Glad you enjoyed it!